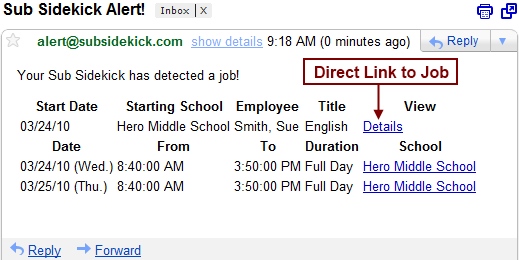 Click the "View this job" link in an email message alert or the "http://j.mp" link in a text message alert. This link will take you directly to the job accept page. Examples: text message or email. If you are near your computer and have the job alert window open, you can click the job you would like to accept. This will take you directly to the job accept page. Please note that you can not accept a job via a reply to a text message or email. Any replies to text messages or email messages will be discarded and will not result in a job being accepted. If you are near a telephone, you can call the Aesop® phone line and accept the job over the phone. Call 1-800-942-3767, enter your Aesop® ID followed by #, enter your PIN followed by #, press 1 to hear available assignments, press 1 again to accept the job. For more details visit the IVR Map.